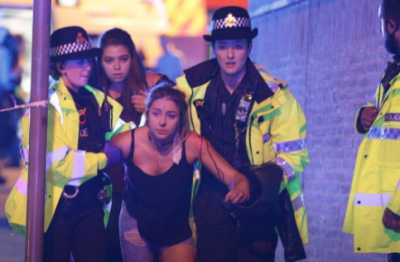 The awful bombing at the Ariana Grande concert in Manchester was clearly an attack on girls and women – this was the demographic of the audience. Grande’s live concerts are largely populated by teenage girls and their mums. By attacking these young girls, the perpetrators, whoever they turn out to be, knew exactly what the result was going to be. The incident happened exactly to the day, four years after British army soldier Fusilier Lee Rigby was murdered by two Islamic lunatics in London. Rigby was a native of Manchester – growing up just a few miles from this same arena. American officials are making much of this point by saying this was no coincidence. US officials have stated within a few hours that the perpetrator was a suicide bomber. What evidence they have for that considering that Britain is the most heavily surveilled state in the world, one can only ponder. One newspaper has already gone with the headline: “Masked jihadi claims ISIS responsible for Manchester terror attack” and stated with some confidence that “A WARPED masked jihadi has claimed the Manchester terror attack is “only the beginning” of ISIS attacks.” Pure speculation of course. Click-baiting on the back of murdered teens out for some fun at a concert. Business Insider reported with some degree of worry that corporate profits might be lost – “Some capital flows are moving into safe haven trades amid reports of the bombing in Manchester. Oh dear! The Daily Star thought it would be a great idea to show the badly bleeding leg of a victim at the event along with the top 12 hottest pictures of Ariana Grande – slightly less classy click-baiting one would have to say. – I’m not sure this is quite the right time to tell that to Mancunians amid the blood, smoke and dust. That last bombing was huge and by some miraculous force killed no-one. This time, it was much worse. MSNBC’s All In host Chris Hayes was speaking to NBC News foreign correspondent Kelly Cobiella when he thought that it was appropriate to more than just speculate with a possible connection between the attack and the June 8 Parliamentary election. David Leavitt, a reporter for CBS decided this was a great time to make sick jokes about the Manchester bombing. And many of his American followers thought this was funny too, looking at the ‘LIKES’ and ‘RETWEETS.’ There is nothing remotely amusing about the murder of citizens at the hand of terrorists no matter where they are. Reddit are off the blocks quickly with a load of youngsters kicking off the usual conspiracy theories. TMZ speculates with some certainty that “the explosive device was a nail bomb in a backpack and it might have been a suicide mission” and that “the bomber was waiting around the exit area as people were streaming out of the building.” How they know this is anyone’s guess. Counter IED Expert Jeff Parks told CNN that explosive devices such as nail bombs first came onto the scene in the early-2000s in Iraq, claiming it was a “very common appliance in the Middle East” and “very handy to place a large amount of explosives and shrapnel.” Nothing suspicious in that comment at all is there. “It was definitely a bomb, the whole building shook. Body parts were everywhere, a torso, an ear. It was the worst thing I have ever seen. Bodies were everywhere,” a woman in Manchester, identified only as Emma, told BBC Radio. In the end, one should not forget some real hard facts about this awful, devastating and very sad event. Someone planted a bomb either on themselves or otherwise with intent to kill children and teenagers in an environment where there were few adults. The response to a British government, who with Machiavellian intent has brought terrorism to our shores from afar by sowing the seeds of hatred should be a strong one. The British people have been forced to pay billions to indiscriminately kill hundreds of thousands of innocent people forcing many to flee the eventual political vacuums that spawned the likes of ISIS. Some arrive with deadly vengeance in their hearts. The disaffected, disenfranchised and frankly some plain old psychopaths use the excuse. How we stop hate filled actions such as this, one can only speculate. One thing is for sure, the politician’s have little or no idea. Their response will be to make political capital out of it and squander many more millions upon a domestic security system such as GCHQ, continue to strip us of our freedoms and civil liberties and treat us like the enemy, whilst our own die on the streets of Britain whilst a vile media takes full advantage. In the meantime, our public services will take the strain with heroic effort and concern for those youngsters and their families to help pick up the pieces of this carnage, the devastation of which, will never leave them.